Dr. 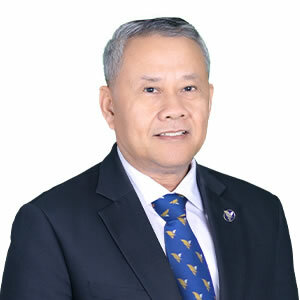 IN Channy, Chairman of the Board of Directors of ACLEDA Bank Lao Ltd.
Economic growth in the Lao People's Democratic Republic (Lao PDR) in 2017, was supported by the expansion of electricity production and power sales, buoyant services sector growth, and construction of the cross-border railway project. GDP growth for the Lao PDR reached 6,9% in 2017. Better commodity prices, an expanding services sector, construction works on the Laos-China railway project, power plant construction, commercial and real estate development will help to continue to support growth in 2018. Expected stronger domestic economic activity and higher oil prices resulting in rising inflation will put pressure on the trade balance. The inflation rate is likely to rise gradually, from 1,6% in 2016 to 2,5% in 2017 and 3,0% in 2018. Growth is projected to further moderate in 2018, but towards a more sustainable level. Continued expansion in power generation, manufacturing, and agriculture are offset by flat mining output, moderating construction, lower contributions from public services and weaker-than-expected tourism performance. On the expenditure side, the moderation has been driven by slowing domestic demand, which was only partially offset by a decent performance of exports of goods. Still, growth remains robust, close to the average for the developing East Asia and Pacific (EAP) region, one of the fastest growing regions globally. Growth in 2017 was driven mainly by strong electricity exports, the construction of large infrastructure projects, and a surge in cash crop production and exports. Reports forecast 7% gross domestic product (GDP) growth for 2018. Net foreign reserves rose from $767 m at the end of 2016 to $887 m at the end of June 2017, providing cover for 1,7 months of imports. The current account deficit narrowed slightly in 2017 on the back of strong exports of electricity, manufacturing and agriculture products while improved metal prices supported higher mining exports. This will help offset the possibly negative impact of falling tourism during the year. Imports increased at a slower pace reflecting moderating domestic demand and gradually recovering oil prices. The current account deficit continues to be financed by FDI and foreign borrowing. Still, reserves adequacy is low, with the ratio of reserves to foreign currency deposits less than 25 percent in June 2017. Exports to the three largest export markets (China, Vietnam and Thailand) increased by about 15 percent in the first nine months of the year. Power exports to Thailand in the first three quarters reached US$825 m compared to US$715 m in the same period last year. Manufacturing of parts and components (electrical machinery, parts and components including digital camera parts and glass lenses, etc.) continued to grow by more than 20 percent in three quarters, reaching about US$300 m. The expansion continues to come mainly from two special economic zones (Vita Park in Vientiane Capital and Savanh-Seno SEZs in Savannakhet province) which continued to attract new entrants recently. Imports increased at a slower pace. The fuel import bill increased gradually in line with slowly increasing oil prices. At the same time, imports related to the railway project construction picked-up in the second half of the year. The latter was offset by completion of the construction of some power projects, import substitution with domestic production (for example, cement) as well as the deceleration of domestic demand. The Bank of the Lao PDR (BOL), in the second quarter of 2017, implemented an expansionary monetary policy that resulted in a decline in commercial bank's deposit interest rate and the lending interest rate. As a consequence, the total credit of commercial banks increased especially for the commerce, industry and handicraft sectors in order to support economic expansion. In addition, the BOL applied a managed float exchange rate regime by setting a daily reference exchange rate. As a result, the exchange rate for the LAK against the USD and the THB depreciated 0,26 percent and 2,79 percent, respectively; headline inflation was recorded at 1.00 percent; money supply (M2) expanded by 1,89 percent compared to the previous quarter; gross international reserves were equivalent to 4,14 months of prospective imports; 12 months term nominal deposit rate for the LAK dropped slightly from 5,48 percent to 5,47 percent, while the lending rate increased slightly from 9,05 percent to 9,30 percent. The total deposits and credits of commercial banks rose by 2,16 percent and 3,24 percent, respectively. The current account deficit increased by 471,79 percent, due to an increase in the import of vehicles, machinery and mechanical equipment. In addition, the number of commercial bank totals 42 which have total assets of LAK 118.236,25 bn, an increase of 2,53 percent; total deposits of LAK 65,128.06 bn, an increase of 2,16 percent (excluding non-resident deposits). In this quarter, commercial banks have also played an important role to support the economy by providing credit to the economy, which accumulated to approximately LAK 63.262,99 bn, an increase by 3,24 percent compared to the previous quarter. In parallel, the number of non-banks totals 176 institutes, an increase of six institutes which have total assets of LAK 3.369,91 bn, an increase of 16,77 percent; and total deposits of LAK 646,54 bn, an increase of 13,27 percent while total credit of LAK 1.711,15 bn, an expansion of 61,72 percent compared to the previous quarter. Economic growth in 2018 is projected to further ease to 6.6 percent before picking up slightly between 2019-2020. Growth is projected to further decelerate next year as current trends continue. This could be indicative of declining potential growth in Lao PDR reflecting limitations of growth driven by natural resource and public spending. Still, additional capacity that is expected to be installed in the power sector and an increased focus on improving the business environment is expected to boost the country's potential in the medium term. Growth will continue to be driven by the power sector, while greater ASEAN integration opens opportunities, especially in agriculture, tourism, retail trade, as well as some manufacturing as part of the regional value chain. These sectors have significant potential to create jobs and lower poverty further. The medium term fiscal plan envisages a gradual reduction of the fiscal deficit helping to stabilize and eventually put public debt on a sustainable path by 2020. The revenue improvement is expected to come from a planned increase in excise tax rates, strengthened revenue administration, improved taxpayer services and the launch of a modern revenue management information system. The authorities, with support from development partners, recently completed a tax policy review and are finalizing a plan for tax administration improvement. Building on these efforts, during 2018, the authorities plan to revise the Law on VAT and the Tax Law, and adopt a new law on Income Taxation and on Excises. At the same time, spending growth will be controlled through continued strong control over the wage bill and public recruitment (intake of new staff will be further reduced to 3.000 in 2018), cancelation of some public investment projects as well as cuts on non-essential spending. Inflation is expected to pick up but remain in the low single digit area. Further fiscal consolidation, low pressure over income, moderate credit growth and a gradual recovery in commodity prices are targeted at less than 5 percent. The board met face-to-face four times in March, June, September and December during the course of 2017 and in addition the Board passed resolutions by e-mail. Reviewed Bank's quarterly Financial Reports and received progress reports on all operational aspects of the Bank's operations including services and products. Approved the Audited Financial Statements and Annual Report for the year 2016. Reviewed and approved Business Plan, Budget and Capital Expenditure Plan, and Funding Strategy 2018. Reviewed and approved the Amendment of TORs for Board Committees. Reviewed Reports of Board Committee Chairmen and Chairwoman on their Committee activities. Discussed and approved the resignation of one Board Member and the nomination of a new Board Member. Discussed and approved the nomination of a new Managing Director & CEO of ACLEDA Bank Lao Ltd. Reviewed and approved Amendments to the Credit Policy. Approved changes to the logo of ACLEDA Bank Lao Ltd.
Approved opening LAK, USD, and THB accounts with BOL. Approved the selection of Ernst & Young Lao Co. Ltd (EY) as the external consultant to assess the implementation of BASEL II. Approved setting an inflation rate for ACLEDA Bank Lao Ltd.'s employees for 2017. ACLEDA Bank Lao Ltd. received a Certificate of Appreciation for "good" performance in the banking sector for 2017 from the Bank of Lao PDR. There were only four banks in the Lao PDR including ACLEDA Bank Lao Ltd. that received this distinction. At the end of December 31, 2017, ACLEDA Bank Lao Ltd. had 1.081 staff members working in 41 offices nationwide. The Bank had total assets of USD 160.507.965, gross loans outstanding of USD 126.651.407 and a balance of deposits of USD 91.142.554. From a performance perspective, we are pleased to report that ACLEDA Bank Lao Ltd. had its fourth consecutive year of increase in terms of income which was USD 26.769.016. Our deposits grew by 6,47% and our assets increased by 5,04%. The loan increase mainly stemmed from an increase in loans to small 2 and small 3 enterprises. Last but not least, we would like to express our sincerest gratitude to the Government of the Lao PDR, the Bank of Lao PDR, regulators, and all relevant authorities for their guidance and support for the development of ACLEDA Bank Lao Ltd., and to our shareholders and customers for their strong support, to the management and staff for their strong commitment, and of course to the Board of Directors for their good corporate governance and strategic guidance in support of the development and the sustainable success of ACLEDA Bank Lao Ltd.